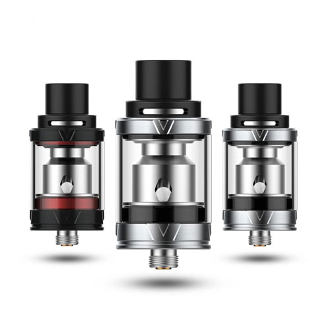 The Veco Tank is a petite 2ml tank designed by Vaporesso. The Veco Tank keeps with the standard design of the tanks on today’s e cigarette market that Vapers have come to love. It is a top fill atomizer, a feature cherished by many for its ease of refilling without having to detach everything. It also helps eliminate mess fills and “uh-ohs” from less than coordinated users. Located at the top is another beloved feature: the adjustable airflow control. The adjustable airflow control lets the user choose how much airflow they are actually getting. If they open the airflow all the way the user will have a plethora of vapor released on exhale or if they close it partially, they may experience more resistance and a vape with a more smoke like appearance than a cloud. The Veco can have its coils replaced through the bottom of the tank. With just a twist of the bottom base you will have access to the coil and can replace it for that magical flavor and hit just like it’s the first time all over again! The Veco Tank can become fully disassembled for cleaning and maintenance which keeps everything fresh and running properly!